Rice Cooker | The Sassy Spoon: Fun Food! Ecstatic Meaty Velvet…. that is how I describe the end result of this dish. 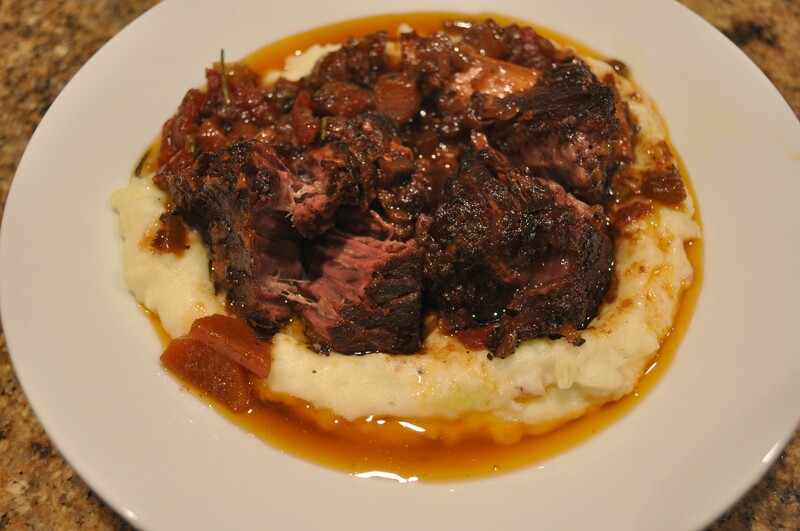 Short ribs are covered with spices and then seared, then the vegetables are caressed by the fire and finally the braising liquid of tomatoes, porcini mushroom broth and Belgian Ale are married to the pot. In go the short ribs and they braise for 3.5 hours (or just 40 minutes in the IP) while the sauce concentrates as the veggies become succulent. I served them this time over grits, sometimes I elect mashed potatoes. This is the kind of meal that ends with pristinely clean plates, except for those bones which gave up their marrow in the dish. A sacrifice well appreciated. 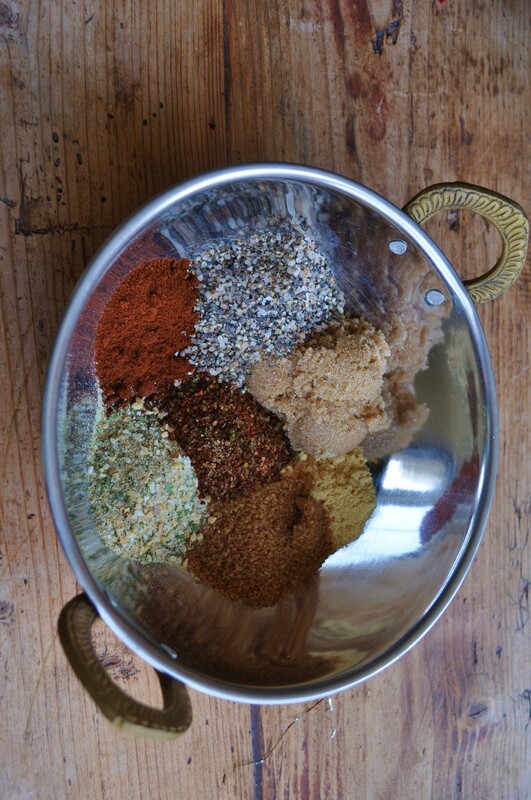 Here is how you do it, feel free to exchange out the spices to your personal palate, this is just what works for me. 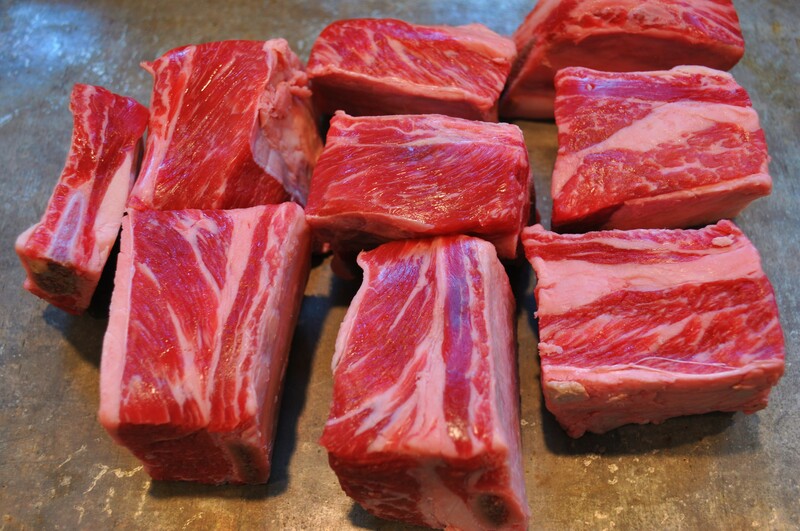 You will need 6-8 meaty English Cut short ribs to feed two. 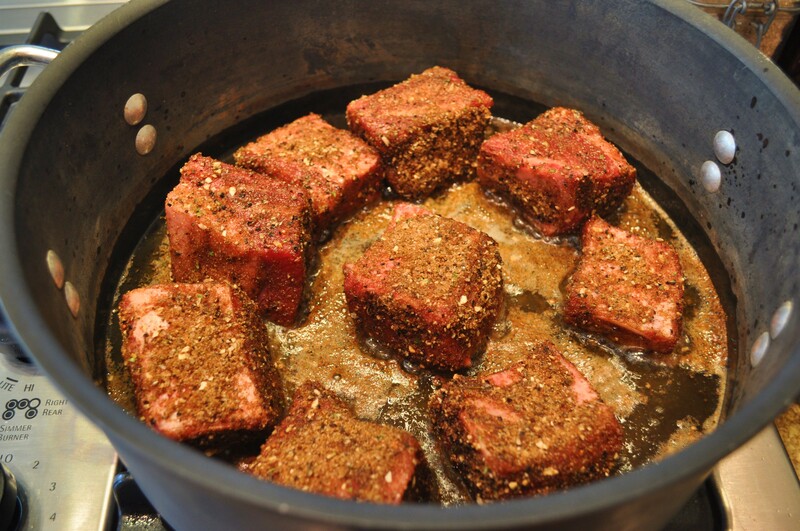 This recipe can be doubled, but when you brown the ribs, do it in batches. The smoked paprika is essential, find it! 1/4 cup home rendered lard. Preheat oven to 375 (I use convection roast setting). 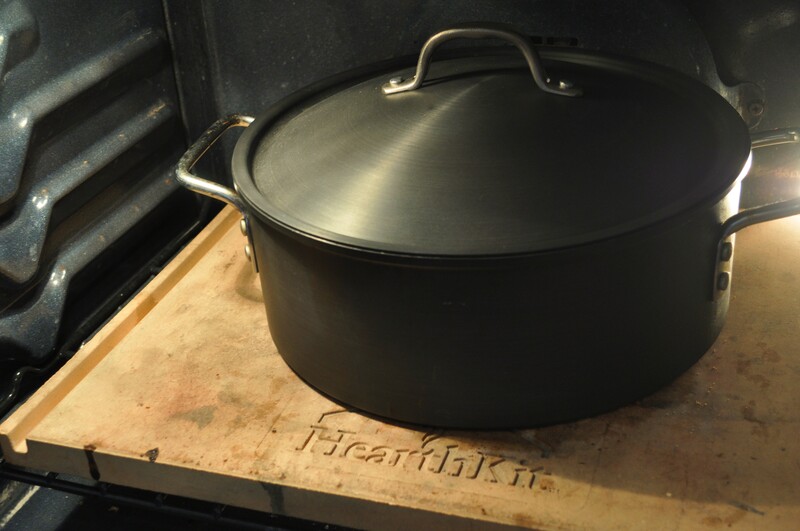 Be sure that you will have room for the lidded pot or dutch oven to fit on the rack on the lower third of the oven. 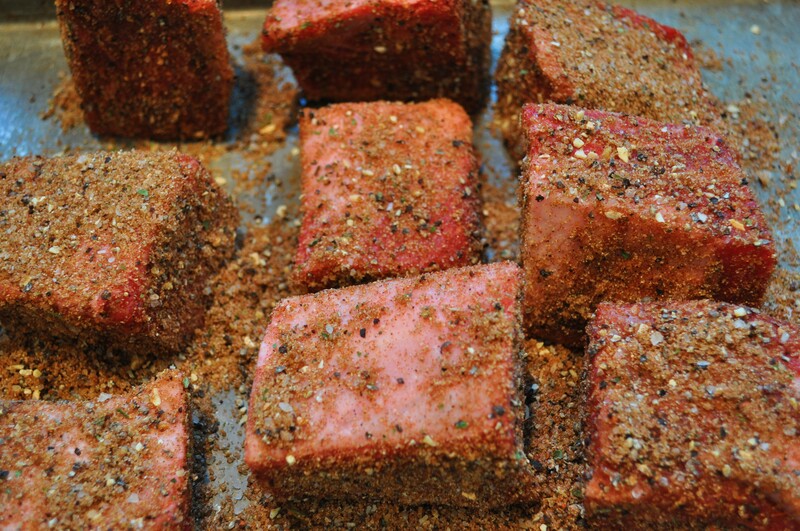 Blend the spice mix and generously coat the ribs with it on all sides. There will be some leftover, reserve it. 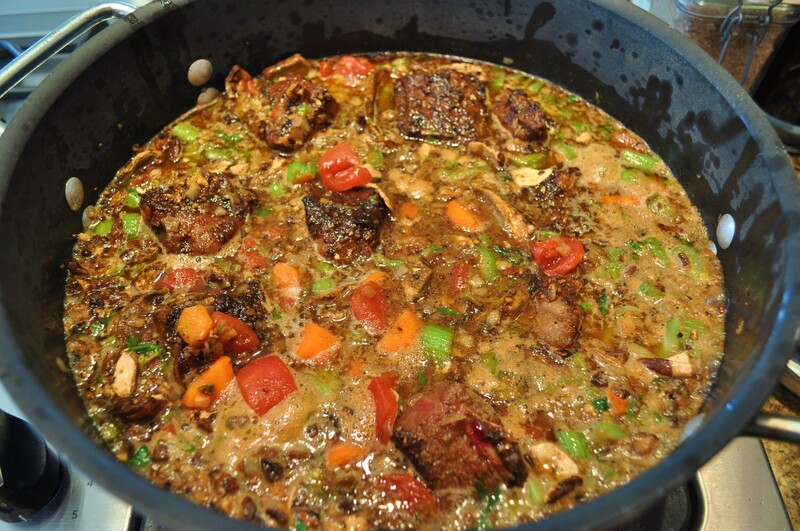 Heat the lard or oil in a large deep pan or dutch oven. Saute setting on the IP. Brown the ribs taking care not to crowd them, do them in batches if your pan is not large enough. This should take about 1 minute per side. Transfer meat back to a plate or sheet pan and ad the shallots, carrots, celery and bay leaves to the pot and cook over moderate low heat, stirring occasionally until vegetables begin to soften (about 3 minutes), clear a hot spot and add garlic. Cook for 1 more minute. Stir in mushrooms. For the IP secure cover and cook on the meat setting for 40 minutes. Or, cover and place in the oven and braise for 3 hours, checking after about 1.5 hours to see if more liquid is needed, if so add beer, stock or water. Remove from oven and allow to rest for about 10 minutes. Serve over mashed potatoes, grits or polenta. Click here for the perfect grits/polenta recipe. I doubt that there will be any meat left, but if there is it makes amazing tacos. 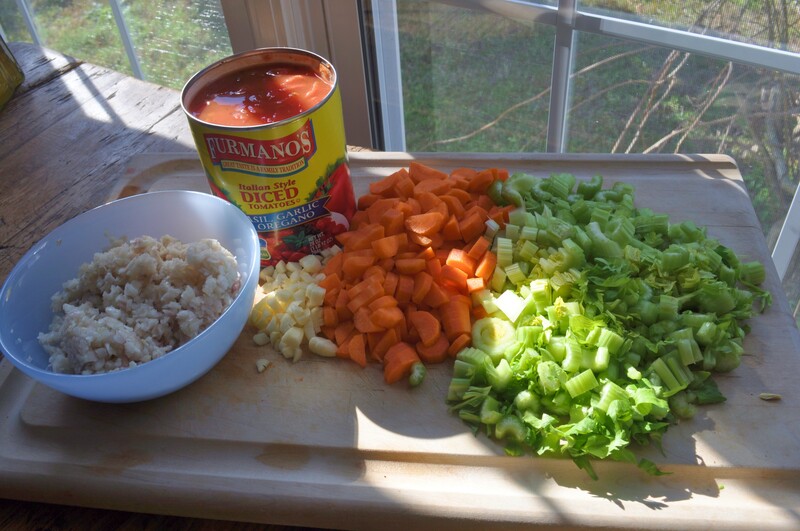 Any veggies/sauce left are great for a soup, just add more liquid and puree. 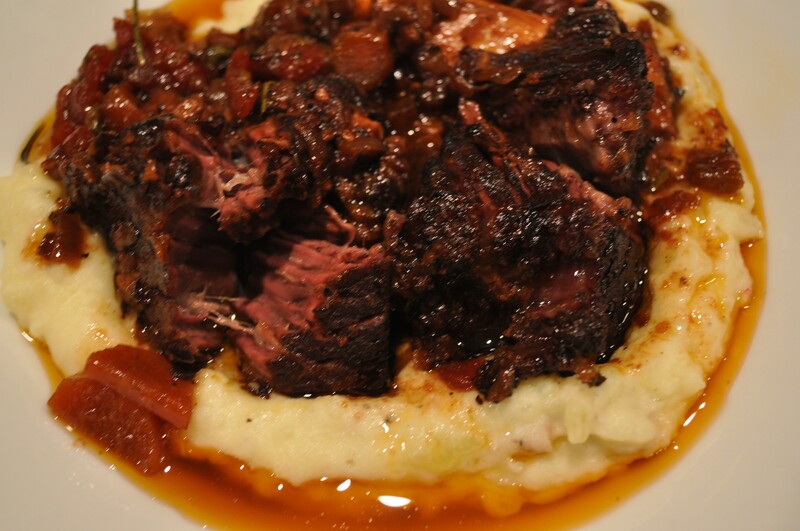 If you liked this, you might also enjoy Smoked and Braised Pork Shoulder Latin Style. This is lovely perfumed rice that has a crunchy bottom and a pillowy soft center. You can also do this on the stove, but it works best if you use a non stick pan to make it in. I did this in my digital pressure cooker which has a rice cooker setting. You can halve this recipe if you want, but it is great for leftovers. I used leftovers of this rice in my Avgolemono Soup here. 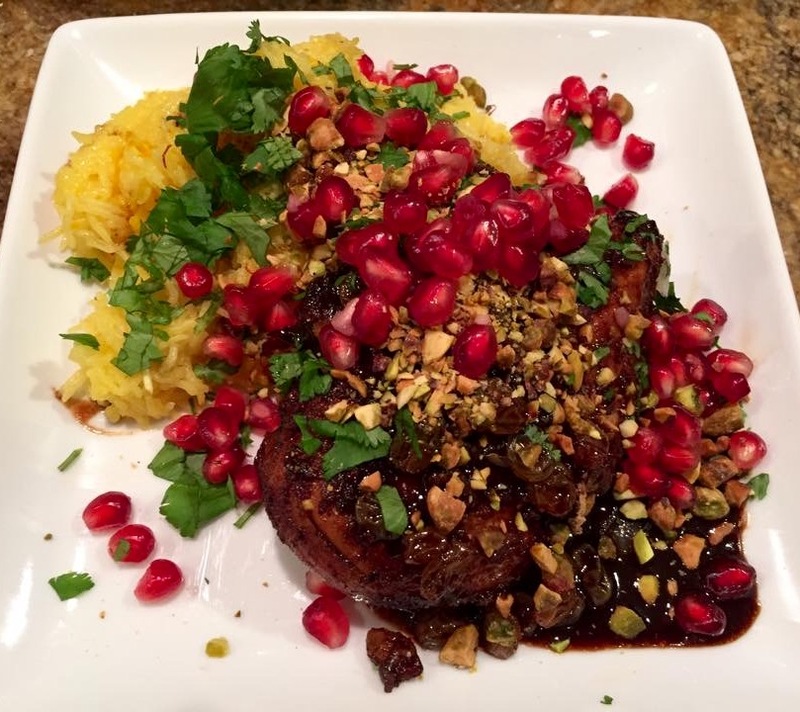 I serve this with lots of things, but most recently made it with this amazing Pomegranate and Pistachio Chicken. 4 tablespoons ghee (clarified butter). If you don’t have that, vegetable oil is OK, but not as good! 1/4 tablespoon ground saffron threads dissolved i 1 tablespoon hot water. (use a sugar cube or a teaspoon of Sugar in the Raw in a mortar and pestle to grind up the saffron threads. You can store Saffron water in the refrigerator for up to 6 weeks. 3 TBS full fat yogurt. I buy mine at the Indian Grocery. I think it has the best texture and flavor, but as long as you get full fat you will be fine. In the pressure cooker on saute or in a small pan, add the ghee, yogurt, and 1 cup of the rice. Brown and stir till the rice is golden. Put it in the bottom of your cooker. In a separate bowl mix remaining rice, water, salt and saffron threads. Stir well then add to the cooker. Cook on brown rice setting. Or if using a pot, about an hour covered. Put a tea towel between the lid and the pot if using a pot. Allow rice to cool for ten minutes. Turn out on a platter or large bowl, the crust should be on top.